More than 60 supporters joined Beat SCAD at our annual walk on 30 September. The event is a chance for patients, families and friends to meet, raise awareness of SCAD and funds for research. 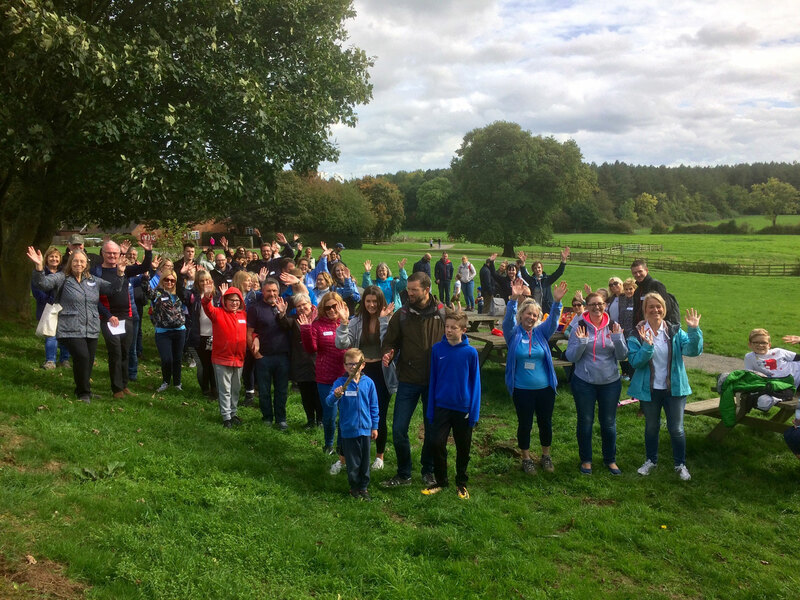 In the beautiful surroundings of the Battle of Bosworth Heritage Centre and Country Park, 19 SCAD survivors plus friends, family and Dr David Adlam, who is leading the UK SCAD research, met for a picnic followed by the walk and an update on the research project. We were pleased to welcome Nikki Gardiner, Clinical Lead for Cardiac & Pulmonary Rehabilitation at University Hospitals of Leicester NHS Trust, and her family to the walk too. Many SCAD patients are offered cardiac rehab after their event, however the research team are aware that this needs to be adapted for SCAD patients, as most are already fit and leading active and healthy lifestyles. Nikki gave a talk about cardiac rehab at Beat SCAD’s 2016 conference and is investigating changes that can be made to the programme to take into account the needs of SCAD patients. After the walk, Dr Adlam gave an update on the research, thanking Beat SCAD for its £25,000 donation, which has helped to ensure the research can continue. Reassurances to the SCAD community that despite the end of the initial BHF funding that enabled 100 SCAD survivors and 40 healthy volunteers to attend Glenfield Hospital for research assessments, the Leicester research is continuing thanks to funding from Beat SCAD and the Leicester NIHR Biomedical Research Centre. Blood samples are being collected for blood markers and DNA. The team will be setting up some blood clinics around the UK in the coming weeks (likely to be Cambridge, London, Oxford, Bristol and perhaps Sheffield) and will also be sending blood tubes to SCAD survivors who have not yet given a sample in the hope that samples can be taken by a GP or nurse and mailed back to the study team (in a pre-packed addressed and stamped box). Getting as many samples as possible is key to these studies so look out for yours! A comprehensive review of coronary imaging of research participants and computer modelling of dissected arteries is advancing the team’s understanding of how SCAD develops. CT and MRI scans of SCAD patients and healthy volunteers are being reviewed by FMD specialists in a blinded fashion (i.e. the reviewer does not know if the scan is for a patient or volunteer) with an aim to address the varied levels of FMD reported among SCAD patients from different countries. Publication is expected in the next 6 to 9 months. Abi Al-Hussaini has now moved to a consultancy position in London where SCAD patients may be referred for ongoing care. Abi continues to work on data analysis. Alice Wood is the new research fellow at Leicester – her position is partly funded by the Beat SCAD donation from July. Anna Baranowska, a PhD student is working in the lab on blood sample and skin biopsy research. Adlam is collaborating with Professor Mary Shepherd, Europe’s leading pathologist, to investigate SCAD in relation to sudden cardiac death. Updates on the global collaboration that is working towards the release of a Position Statement (Europe) and Consensus Statement (USA) – a major step forward in setting a baseline of clinical advice related to SCAD. The publication of initial findings is expected to place the research team in a stronger position to apply for additional funding sources as there are numerous strands of research being pursued concurrently and evidence to continue these pursuits. Beat SCAD has an important role in continuing to contribute to funding. It is very common, and very normal, for SCAD survivors to worry about having another SCAD but this is a concern that generally reduces over time. Adlam discussed the differing recurrence rates reported from different global studies ranging from less than 10% to as high as 20-25%. Adlam offered some explanation in terms of an inherent bias in some studies. For example, in the UK, we have the NHS which means anyone can be referred to the Leicester research team. Whereas, in the US, there is arguably much more personal cost involved in a patient attending the private Mayo Clinic due to the different health care system, high fees, long distances to travel etc. which means the people who are more likely to invest in travelling to Mayo Clinic would tend to be the more severe cases and/or those who have experienced recurrence and are keen for expert opinion. Adlam explained that imaging evidence from recurrence patients is encouraging in that the long term health outlook is still good and recurrent events tend to be minor generally and don’t usually cause severe heart damage. As a further note of positivity, Dr Adlam emphasized that SCAD patients are far more likely to NOT have a recurrence so a ‘glass half-full’ outlook is strongly encouraged. Adlam commented that ongoing chest pain after a SCAD event is so common that it is almost universal in the patient group, and the pain symptoms often continue for longer than doctors would normally expect in terms of healing pain – typically 6-9 months after the SCAD event. Though, patients reporting ongoing pain tend to acknowledge that it is unpleasant but not as bad as their original SCAD event. The reason for this ongoing pain is not yet fully understood but Dr Adlam stated it could be related to blood vessel structure and SCAD patients may have more reactive arteries compared with the healthy volunteers. Researchers are assessing the use of vasodilator medications during the first year post SCAD. Rebecca continued: “After the second Beat SCAD conference in November 2016, the Trustees decided to move the next conference from the annual slot in November 2017 to Spring/Summer 2018 for a number of reasons, the main one being to allow more time for data analysis in order for research updates to be the main focus of the next conference. Receiving an interim update on progress at the walk was a huge privilege and confirmed that we will have an incredible agenda for our 2018 conference. Beat SCAD is already working towards the next £25,000 donation to help ensure the research continues and fundraising at the walk will contribute to this. The total raised from the walk is approximately £1700, so huge thanks to everyone who attended and those who supported us from afar.